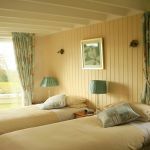 Situated in a tranquil, rural setting near the historic city of Carlisle and Hadrian's Wall, where a warm welcome with a taste of Cumbrian luxury awaits… Enjoy many of the luxuries of a fine hotel combined with the relaxed atmosphere of a family bed and breakfast. 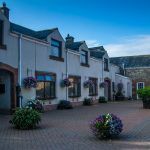 Set in beautiful scenery, yet convenient for major road routes (M6, A7, A66, M74), there is plenty to do and see in the surrounding area - Hadrian's Wall National Trail, the village of Gretna Green, the Solway Coast, the Lake District, Kielder Forest, the scenic Border Region and Carlisle Castle. Daily rates for luxury double/twin en-suite rooms and Courtyard apartments, on a bed & breakfast basis. A renowned Cumbrian farmhouse breakfast is served, to set you up for the day. Also included is a range of fruit juices, cereals, fresh fruit, porridge (served with local honey, cream and Drambuie) and home-baked bread served with local marmalade, preserves and traditionally-made butter. Afternoon Tea and evening meals are available, where booking is essential.